This disc from 2L celebrates the 25th anniversary of the founding of Nidaros Cathedral Girls' Choir (Nidarosdomens jentekor) in 1992. Unusually, the the choir, conducted by Anita Brevik, has chosen to celebrate the event with a Requiem, but this is no ordinary Requiem and Andrew Smith's work commemorates the victims of the massacre in Utøya and Oslo on 22 July 2011 [read more about the background in my interview with Andrew]. For the Requiem the choir is joined by saxophonist Trgve Seim and organist Ståle Storløkken. And the disc is completed with two works by the Norwegian composer Ståle Kleiberg with TrondheimSolistene. Nidaros Cathedral is the historic cathedral in Trondheim, founded in the 11th century. The Girls' Choir, artistic director Anita Brevik, was founded in 1992 and has strong record in commissioning new music. There is a fascinatingly ungraspable, changeable quality to Andrew Smith's Requiem which forms the centrepiece of the disc. For a start, much of what you hear is improvised, as the work uses an improvising solo instrument alongside the choir. 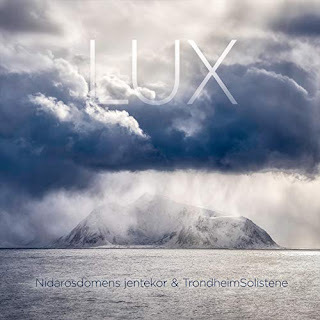 For the original performances in 2012, the improvising instrument was a trumpet as the part was written for Arve Henriksen, but as he was ill for the recording they changed to the brilliant saxophone playing of Trygve Seim heard on the disc. Using an improvisation with a large-scale work designed for choir and organ requires some organisation, and Smith has solved the problem by writing the piece in blocks, with the choir often providing aleatoric sections over which Seim improvises, so in fact both saxophone and choir provide music which will change from performance to performance. Yet this ungraspable quality applies to the very intention of the Requiem itself, because Smith's original idea was simply for a requiem to child victims, it was whilst he was writing it that the tragic massacre happened (in 2011), with some of the victims being friends of members of the choir. Smith has used the basic structure of the Missa pro defunctis, but replaced some of the texts with those referring to child victims and other martyrs, so there is Rachel's despair at the abduction of the children of Ramah ('Vox in Rama'), King Herod's massacre of the innocents, and Mary weeping at the foot of the cross. Much of the writing for the choir is chant-inspired, with the organ part played by jazz-organist Ståle Storløkken creating complexity of texture. And of course the saxophone improvisation of Trgve Seim, which really makes the work distinctive and there is never any hint that the part was originally written for a trumpet. Smith interweaves his forces in blocks, and the writing is carefully yet imaginatively done so that the piece is within the capabilities of a choir of young girls (age 10 to 19), but creates a sense of complexity. The result is very evocative, and though inevitably the combination of chant and saxophone evokes Jan Garbarek and the Hilliard Ensemble in Officium, there is plenty here which is new and different. Smith's sometimes jazz-influenced harmonies seem to work well with the chant-like vocal lines from the choir. Whilst Smith is adept at creating evocative textures, drama is not lacking and the more powerful sections pack a punch. But overall, for all the work's complexity, it is the sense of the meditative which stays in the mind. The performances are very fine, whether it is singing a long line or creating evocative aleatoric textures, the girls of the choir are never fazed by the music's demand, this is a very poised performance. Both Storløkken and Seim contribute immensely to the overall texture and ethos of the work, and for many it will be Seim's hypnotic playing which stays in the memory. Ståle Kleiberg's music, whilst equally tonal, is rather different in that Kleiberg uses the strings of TrondheimSolistene and both his works on the disc seem to move between stubstantial string ensemble works and choral writing. Kleiberg's string writing is vigorous and striking, with the music for the girl's choir seeming floating over the top. The disc comes with both ordinary audio disc and Blueray audio disc, plus full texts and translations. Neither Kleiberg nor Smith is a big name in the UK, and whilst Smith was born in the UK he has lived in Norway since his teens and trained at Oslo University. I can highly recommend the disc, and Smith's work in particular would seem well worth investigation by UK choirs. Music is magical. May I suggest word change from phased to fazed in commentary on the Andrew Smith Requiem?